My Mind to Paper with a little help from a friend… ink! Self Directed Essay: Using Marcel Duchamp’s proposed definition of the spectators’ role in the Creative Act, create a framework to analyse Ken Currie’s development in his approach and thinking process circa 1995, focusing primarily on ‘Three Oncologists’ (2001). Using Marcel Duchamp’s proposed definition of the spectators’ role in the Creative Act, create a framework to analyse Ken Currie’s development in his approach and thinking process circa 1995, focusing primarily on ‘Three Oncologists’ (2001). 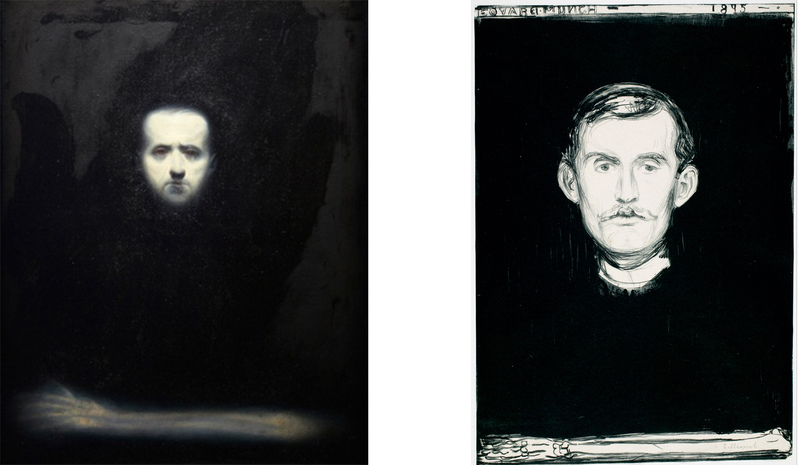 In order to analyse and discuss the methods used by Ken Currie (b.1960) in creating Three Oncologists (2001) (Fig 1), I will first discuss Duchamp’s acute observation. Duchamp brings to the surface the thought-provoking power obtained by the spectator in the communicative process in observing art, and it is we, the spectator who justifies the artist’s prophecy, whilst he, having no determination of the direction of which the outcome will be, the act of transubstantiation is what completes the work of art. Duchamp states that the creative act is not executed by the artist single-handedly; we, being the spectator carry the work, ‘‘deciphering and interpreting its inner qualifications’’ applying our own definition and generating responses influenced from the external world, becoming our own contribution to the creative act. In some cases this creative act can develop in rehabilitating ‘forgotten’ artists when successors contribute in giving their own spectation of the work. By defragmenting Duchamp’s methodologies and observations of the creative act, from the genesis to the release of the work of art, three key stages have come to the surface, these being; the artist’s intentions and influences; the artist’s methods and the application of, in which the final piece is created where; the observer’s reaction, response, interpretation of the painting’s final outcome can be discussed. Applying these stages of the creative act to focus and analyse Ken Currie’s oil on canvas illustration entitled Three Oncologists (2001) (Fig 1), I have now constructed a framework for my own analysis. Having discussed the development of Currie’s style and adaptation of his visual basis, the nature of his work was inspired by his visit to the Imperial War Museum in London, where he saw the death mask of Himmler presented in a glass case. The intensity of the luminous white plaster set against the deep black velvet, which he describes as “earthly remnants that somehow give the dead an afterlife in the present, like an echo of their physical presence. These plaster casts have a corporeality and verisimilitude which I find awesome.” (Currie, 1999: 3) An appearance of the real; referring to the remnant of Himmler’s being and physical self in the form of the mask, and in spirit; which Currie describes as “a kind of chilling imperishability about him.” (Currie, 1999; 3) Thus igniting a particular interest in death masks, which lead him to collating photographs from the catalogue of death masks supplied by Edinburgh University’s Anatomy Department and using this research as a reference to formulate his own style into his paintings, and by removing physical contact, it enabled him to focus on the image rather than the object alone. In doing so, his painting can be approached as a photographic photo-journalistic documentation of his observations, as if capturing what he sees, with his own imagination in the same way one would capture a subject or an event using a camera. Throughout this progressive process, Currie describes the genesis of his determined direction as “the beginnings of an all-consuming concern with the implications of our mortality” (Currie, 1999: 3) exploring emotional complications and consequences of sickness and the notion of diseases as metaphors, focusing on current social and political outstanding issues in today’s society, highlighting and bringing to the surface how the human body is affected by illness, ageing and physical injury which is inspired and influenced by his observations of his current surroundings. Currie states that during this time, he felt obligated continuously to respond to his observations by translating it through his own work, and in doing so he had a keen desire to not confine and allocate his observations but to visually translate each experience into “universal images, capable of communicating across boundaries” (Currie, 1999: 4) where paintings that are generally absent in subject are concerned, are conveyed through a philosophical meaning, reliant on the semiology that can be found in our sociological language and once applied, translated through our own understanding, triggering a particular memory, a recognisable environment. Currie states that at the time of this transition within his work, he found he was on impulse, moving toward a figurative minimalistic quality, “avoiding literalism, narrative and rhetoric emotionalism” (Currie, 1999: 3) allowing his work to become sparser, enabling him to become more spacious in his practice, more simplistic, centring his subject matter. For example, Currie’s oil on canvas ‘White Table’ (2002) (Fig 4), can be associated with something one would find in the environment of a surgical treatment room, signifying an operating table or a mortuary slab. 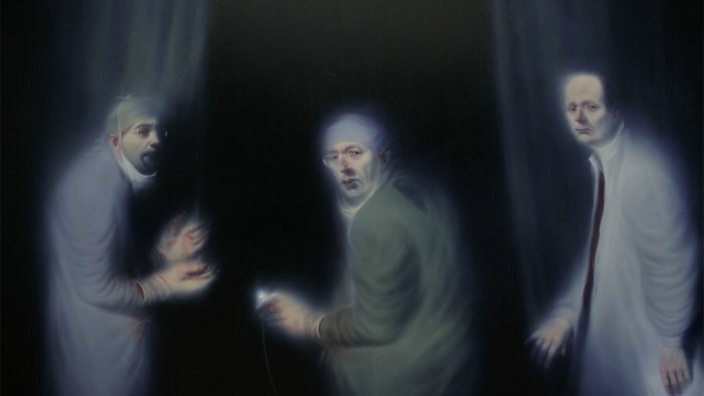 In the case of the triple portrait, Three Oncologists (2001) (Fig 1) are given the superior intellectual elitist status of ‘Oncologists’; their garments and apparatus, the mask and blood stained gloves, the white coat and surgical notes, clearly depict the event of an operation within a surgical environment. Putting aside the use of semiology signifying key elements within the frame, the adopted, influential style sparked by Munch’s approach and over the century evolving into a progressive and consistent conversation, with an essence of Rembrandt, carried and apparent in both paintings as well as throughout the discourse of his works. Within Three Oncologists (2001) (Fig 1) Currie’s application of colour plays a fundamental role in interpreting the nature of his work, Currie strips away references of place or location, the central forms appear to be suspended, representing as an illusion of space which surrounds the subjects, but Currie clarifies that his application of colours intended function is of a metaphorical use. “The darkness not only represents a space around the form but is intended to function metaphorically as well, in that it represents a space beyond material existence – nothingness.” (Currie, 1999: 3) The deeply set black; metaphorically is used to imply an intuitive terror of the unknown, the end of existence and nothingness – death, and the luminosity of white; implies life, what we see and the limited information on what we know about our existence, creating an ominous division between the subject and its matter and the metaphysical space that we, consciously are not visibly able to see. Married to the use and application of colour, where the portraits are concerned in the Three Oncologists (2001) (Fig 1) the response is fully dependant on the emotions portrayed through the expressions emitted from his floating subjects, which functions are, adjoined to the key elements discussed previously, to narrate the event that has been captured within this one single frame. In this case, the event being what seems an operation (this being based on my previous observation) in which the onlooker playing as a double role as the spectator, has disturbed the oncologists resulting in what should be a startled reaction, but the oncologists appear to be devoid of all emotions and an essence of fear can be sensed, thus emanating the intensity of the struggles and demands of medical scientists – “Represents the almost spiritual pressure placed on oncologists as putative dispensers of healing in the face of the disease.” (Farthing, 2006: 925). Society has reached a point where they rely and seek on those of superior status and elitism for answers, extending one’s life, when those of superiority, question the same lore that Currie articulates into his own work, articulating the notions of fear into this painting that is felt by the Western society when contemplating the lore and reality of the life threatening and stigmatised disease – cancer. Encapsulating this notion with an acute echo of Rembrandt’s visual approach, the art of this painting schemes into a contemporary intellectual quality, as well as establishing the set out paradigm for the body of work within the exhibition, Currie is noted as “one of the outstanding painters of our time” (Currie, 2003: 3). Three Oncologists (2001) (Fig 1) – a major commission initiated by the National Galleries of Scotland becoming the triple portrait, depicting 3 medical scientists from left to right of the frame; Professor R. J. Steele, the Head of Department and Professor of Surgery – Professor Sir Alfred Cuschieri, and Professor Sir David P. Lane whose practices behold an international reputation of the Department of Surgery and Molecular Oncology at Ninewells Hospital in Dundee, Scotland, and this imagined representation from the artist is described as “a landmark” (Currie, 2003: 3) by Duncan Macmillan in The Scotsman, marking a fundamental juncture in this era where we have succumbed to the fact that we are all defenceless of this circulating life-threatening, in majority of cases, incurable disease. Referring back to Marcel Duchamp’s definition of the spectator’s role in the Creative Act and applying it to Currie’s own experience, he adopted Munch’s approach and formulated it into his own style – “the spectator brings the work in contact with the external world by deciphering and interpreting its inner qualifications.’’ (Lebel, 1959: 77/78) Through my observations and analysis I have underlined Currie’s role in ‘completion’ of the creative act as the spectator within Munch’s lithograph ‘Self Portrait with Skeleton Arm’ (1895), becoming influenced and inspired by Munch’s approach, “and thus adds his contribution to the creative act.’’ (Lebel, 1959: 77/78) Currie having taken on this style and with his powerful “landmark” in art history, presumably posterity will take its course in completing the Creative Act within one of his own works, as it stands, it marks a crucial point within this era, reflects on the Western society and medical science which is forever evolving and exceeding, but then comes to mind that ostensibly, the spectator’s role will live on forever within each and every single art work and that the Creative Act will never be complete, becoming a progressive conversation through time. Lebel, R. (1959); Marcel Duchamp, New York: Paragraphic Books. Lebel, R. (1959); Marcel Duchamp, New York: Grove Press. Currie, K. (1999); Ken Currie, London: Panart Publishing Limited. Currie, K. (2003); Ken Currie: Recent Work, London: Flowers East. Farthing, S. (2006); 1001 Paintings You Must See Before You Die, London: Octopus Publishing Limited. Normand, Tom. (2002); Ken Currie: Details of a Journey, Aldershot: Lund Humphries. Fig. 3. Munch, E. (c.1895) Self Portrait with Skeleton Arm [Lithograph] At: http://www.britishmuseum.org/explore/highlights/highlight_objects/pd/e/edvard_munch,_self-portrait_wi.aspx. Last accessed 20th October 2012. « The mind’s state: Wiping the dust off. Blogroll - Links to inspirational stuff..